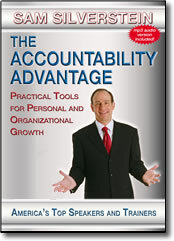 Accountability Advantage DVD by Sam Silverstein – Free Preview – Save! Why do some succeed while others fail? It starts with eliminating excuses, eradicating justifications and taking personal accountability for choices, actions and results. It starts with accountability. In this practical program you’ll learn the four phases of accountability and the five critical, but often overlooked, ways to be proactively accountable. You’ll learn how to increase your success and significance, both in business and in life, and you’ll take an honest look at yourself and values. You’ll also discover what road-blocks might be stopping you from achieving your goals. These principles apply to almost every profession or industry, no matter what you are trying to achieve. By creating an organizational culture based on accountability, companies and individuals grow stronger.